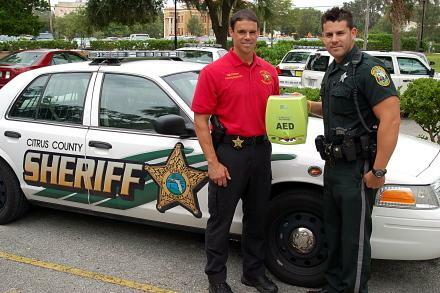 Improve chances or survival from sudden cardiac arrest by providing AEDs in police patrol cars? Sudden cardiac arrest is one of the leading causes of death in the United States taking about 325,000 lives each year. It is well known that CPR and the quick use of an AED dramatically improve the chance of survival from sudden cardiac arrest. In the article by Doug Wyllie, from PoliceOne, he points out that patrol cars already in the vicinity, of a sudden cardiac arrest, may serve as the first responder. Having patrol cars equipped with AEDs could cut down on time to resuscitation, which is key to sudden cardiac arrest survival. Wyllie points out that in Rochester, Minnesota, where each patrol car carries an AED, there is a 52% survival rate and AEDs from patrol cars have revived 127 victims of sudden cardiac arrest. There are many factors that play into survival rates in communities. It is evident that communities with strong CPR/AED education and AED access plans are showing that survival rates can be improved! !